Nicole Harsch and Mike Sakuta are the Crossed Swords. For over 20 years, their Crossed Swords Stage Combat Shows have been seen across the U.S. and Canada at renaissance festivals and science fiction conventions and previous Dragon Cons. Recently, they've been hired to swordfight in such interesting locations as Honolulu, Hawaii; Blackpool, England; Paris, France; Berlin, Germany; and Moscow, Russia. The duo can also be seen in a TBS documentary on Pirates, in an A&E episode of The Unexplained, on the Larry Elmore cover paintings for two Dragonlance books (The Reign of Istar and The Cataclysm), and on the "Cure Light Wounds" card in the Spellfire game. They also teach stage combat and have been fight directors for renaissance festivals and many historical plays including Hamlet, Cyrano, Camelot, Caesar & Cleopatra, Robin Hood, Romeo & Juliet, and I Hate Hamlet. 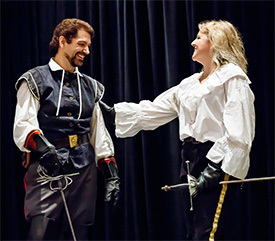 During the school year, they teach history to students all over the country with their swashbuckling educational shows about knights, musketeers, conquistadors, and Roman legionaries. They also run an online sword-selling business, www.swordmark.com, which offers a wide variety of sword designs to their fellow sword lovers all over the world.